Dr. Lewis Levason was born in 1794 in England. In 1860, at the age of 66, Dr. Lewis Levason journeyed to the United States and settled in Nevada City, California. 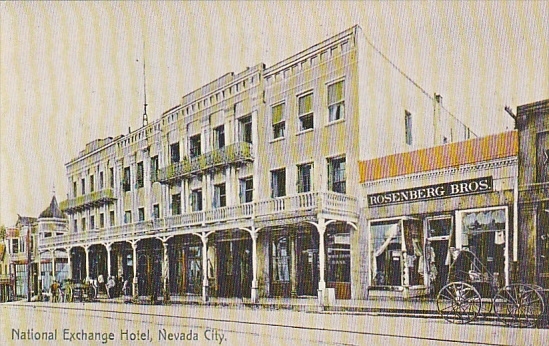 He opened his dental practice on the corner of Pine and Commercial Streets, above Block & Co., which was a mercantile firm. By the advice of his friends, intends residing permanently in Nevada City. He has by him a large assortment of artificial teeth of French, German, English and American make, besides some of the most beautiful manufactured by himself, composed principally of California Quartz!! Those requiring the dentist, will find the benefit of visiting the doctor, he being a thorough mechanic, they will have the advantage of watching their cases during the construction, and the years of experience in allaying the pain of a toothache by Galvanism, or if necessary, extraction with facility, with all operations of scaling, cleaning, plugging & stotping, will at once prove the advantage the ladies and gentlemen of this and adjoining counties will derive by visiting at his office, upstairs, over Block & Co’s store, corner of Pine and Com. Sts., Nevada City, Cal. In 1864, Dr. Levason retired from his practice and moved to San Francisco, where he was naturalized as an American citizen. In 1867, Dr. Levason lived at 1117 Mason Street, in San Francisco. At this time, he had opened a new dental practice with a partner, Dr. James W. Winter. Their office was near Kearny Street at 647 Clay Street. Levason was in charge of the artificial teeth and bridgework, while Winter managed the surgical and operational work. Norton B. Stern, “A Dentist in a Gold Rush Town,” Western States Jewish History 19/2. Samantha Silver is curator of this Dr. Lewis Levason exhibit.